Where can I get The Simpsons: Hit & Run to play this? You can buy it on Amazon: https://www.amazon.com/Simpsons-Hit-Run-Pc/dp/B0000A0V3B. How do I start a mission with my friends? You can't. This doesn't feature missions at the moment, maybe in the future. We do not support chat at this time. What special keybinds are available? Why are you calling this an "official leak"? Because this is not an official release. Lucas has made something amazing, though this is not to the best of any of our abilities and we would not like to call this a "release". This is a leak, this is like pre-alpha. This is a proof of concept. My school and/or work blocked this site! How will I ever play?!? You shouldn't be using Lucas' Simpsons: Hit & Run Multiplayer at school and/or work! Can I have the server executable? The server is extremely broken, it will crash a lot and you shouldn't want to have to deal with that. We're always (this is kind of a lie) doing things to the server and it would probably have to update a lot. The more the merrier! It's always easy to get in a game when there is only one host. 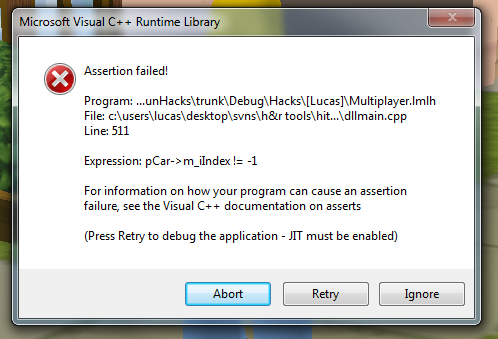 Assertion failed! What do I do? If you see this, we know about it already. Click "Ignore". If the game seems even more broken than it usually is, restart your game. I just saw a car with no driver; what the hell. Will this site ever be removed? We don't intend to keep this version online forever, we'd like to release a better one. But until then, I guess this is here. That doesn't mean this site will always be hosted, it costs money to keep this server up. So if it isn't up sometime in the future, sorry? The server was taken down for maintenance, we should announce this on Discord if we do. maybe? The server crashed, that happens more than it should (at all). We took it down because we realised this was a travesty. The big scary lawyers attacked us in a dark ally; we're probably each in several garbage bags by now. If you can't connect and it's been down for a few minutes, tell us in #shar-online-mp and we'll look into it. Who knows, just cycle your character a bit. Why do I need my Donut Team Authorisation Token? This is to prevent griefing and impersionation. You can press the "X" key to view who's actually who. Users abusing rules while playing will still face the same consequences.